Well, in my quest to find healthier foods I have recently become acquainted with Tropical Traditions Antioxidant Omega 3 Greens. This dietary supplement comes in powder form and is available in two delicious flavors: berry and mint. Tropical Traditions is a company that is known world-wide for its Virgin Coconut Oil. Besides their coconut oil, they also carry a variety of skin care, household and other food-related products. According to my mom, Tropical Traditions is the best place to get Virgin Coconut Oil. She has tried other brands and varieties and Tropical Traditions is the only brand she will buy...she is just crazy about it! Until I was introduced to Tropical Traditions, I was unaware of the many uses of Coconut Oil! Check out the video below and see for yourself... How To Use Coconut Oil: There are hundreds of uses! Wow...I didn't know that you could use coconut oil in your spaghetti sauce! There are so many creative ways to utilize this fantastic product. 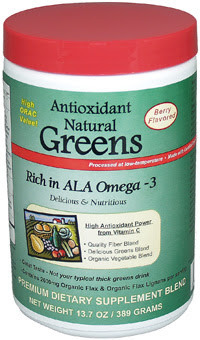 So, for this review I was sent a container of Antioxidant Omega 3 Greens in the berry flavor to try. I am a huge smoothie fan so I knew right away how I was going to use these greens! These Natural Greens are in powder form, making it easy to dilute in water, juice, smoothies and other beverages. I was not sure what the taste would be like though...it sure smelled nice! All you do is add a scoop of the powder to your drink. It does not thicken at all and if you can get past the green color, it looks soo healthy! I simply added a scoop to a glass of cold water and mixed it up well. You will notice that the powder does not dissolve, it simply mixes in. If you use a glass straw like I do, you can see the particles. As soon as I was done mixing my drink and getting ready to try it, my little "mooch", who had been watching me mix it, wanted to try some too! So, to make sure she would like it, I tried it first. It was VERY yummy. I didn't find the flavor unpleasant at all and actually, you could taste the berry flavor. Tropical Traditions Antioxidant Omega 3 Greens are available to purchase directly from Tropical Tradition's website and retails for $38.99 for a 13.7 ounce container. You can choose from mint or berry flavors as well! So, in my opinion...Tropical Traditions Antioxidant Omega 3 Greens is a fantastic product! I am thrilled that my children like it and that I can sneak in some nutrition into their diets. Omega 3's are very important additives to one's diet and if you are a mom who wants to help the family enjoy better health, I would recommend checking out these greens! Disclaimer: I received no monetary compensation for this post. I did receive free product for review purposes. All quotes and stock photos are from the Tropical Traditions website and email. Prize is being shipped by the sponsor. *Canadian residents: Tropical Traditions and this blog is not responsible for customs or duties that Canada may charge for your prize should you win. * All thoughts and opinions are 100% mine.